Wow! 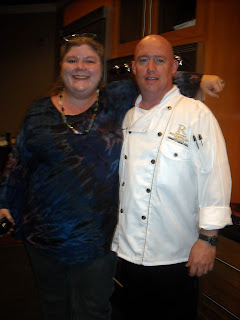 I have been blogging since March, and it's been so much fun meeting other bloggers in Arkansas! 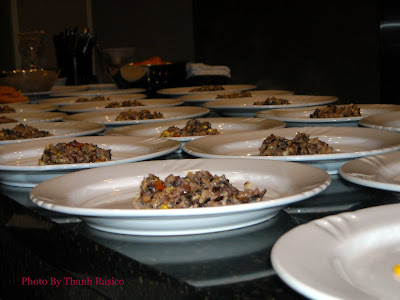 Recently, I was invited by Arkansas Women Bloggers to join their group, THEN I was invited by them to meet at the Winthrop Rockefeller Institute for a complimentary 5 - course lunch wih culinary demonstration. How tickled was I?! Beth Stephens of Little Magpie, The Food Adventuress, and Ozark Natural Science Center was one of the hostesses of the now 400 - member group of Arkansas Women Bloggers. The space did not allow everyone in the group to attend, so I was really flattered to be chosen to attend with 9 others! The Winthrop Rockefeller Institute is located at the top of Petit Jean Mountain in Morrilton, Arkansas. It took me about an hour and ten minutes to get there from Little Rock. 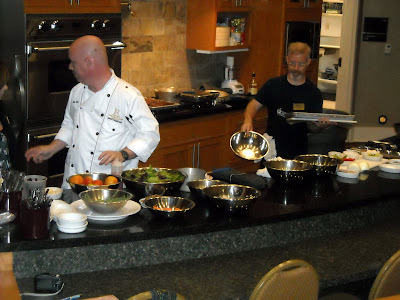 The lodging available ranges from houses to apartments to deluxe rooms or suites. The rates are quite reasonable with amenities such as flat panel TV's, wireless internet, and mini - fridge. All the things I require in an overnight or weekend stay. How very Rockefeller. Yes, those Rockefellers. This is the dining that's available for conferences. I've stayed at the Hilton at Rockefeller Center in New York City, and also attended a conference at the Times Square Hilton. And in comparison, I find that this place is just as nice! (Right here in little old Arkansas.) The institute also offers team building, a Saturday Chef Series open to the public, and many other things to do. 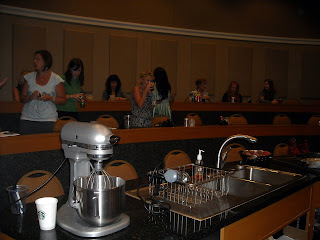 When I arrived, I met with the other bloggers, and then we went into what I'll call their "kitchen stadium" where the seats are tiered with a curved countertop that gave us room for sampling, taking notes, and taking pictures. 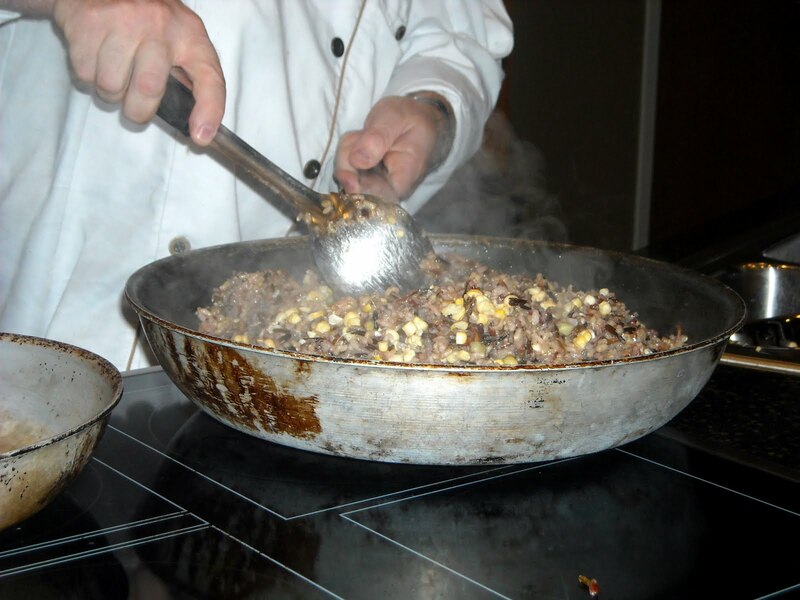 Robert Hall was our chef and culinary education coordinator. Here he is below with Kat Robinson of Eat Arkansas and http://www.tiedyetravels.com/. 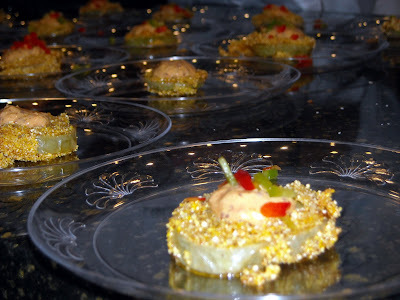 The first course of our meal was Polenta Fried Green Tomatoes - from the farm down the hill. The entire meal was gluten free, which made me happy because my bariatric dietitian friend Courtney says that gluten causes many GI problems. Check out her site at http://www.bariatricbites.net/. The polenta formed a crispy crust around the firm green tomato. The remoulade and sweet red pepper topping completed it deliciously. Are fried green tomatoes just an Arkansas, or southern thing? Hmm. For the second course, we had a mixed green salad with raspberry champagne vinaigarette, freshly picked blueberries, and black walnuts that were "almost" caramelized. So good, I forgot to get a good picture for you. Sorry. 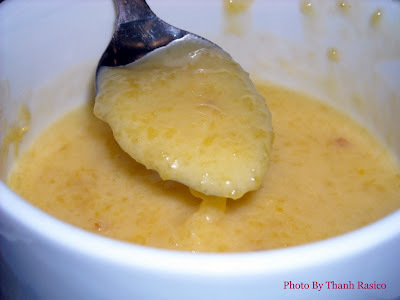 Next, we were served a room temperature Peach Chardonnay Soup. I ate every bite of this refreshing soup! It was really, really good. 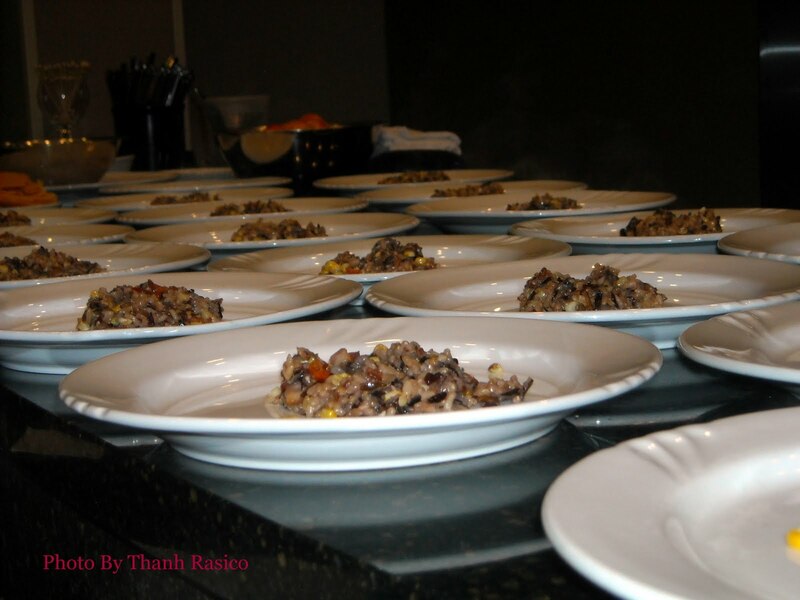 Next, Robert prepared us a Rainbow Wild Rice Succotash with purple hull peas and corn from the cob. The rice was then topped with Steak Au Poivre (with pepper). 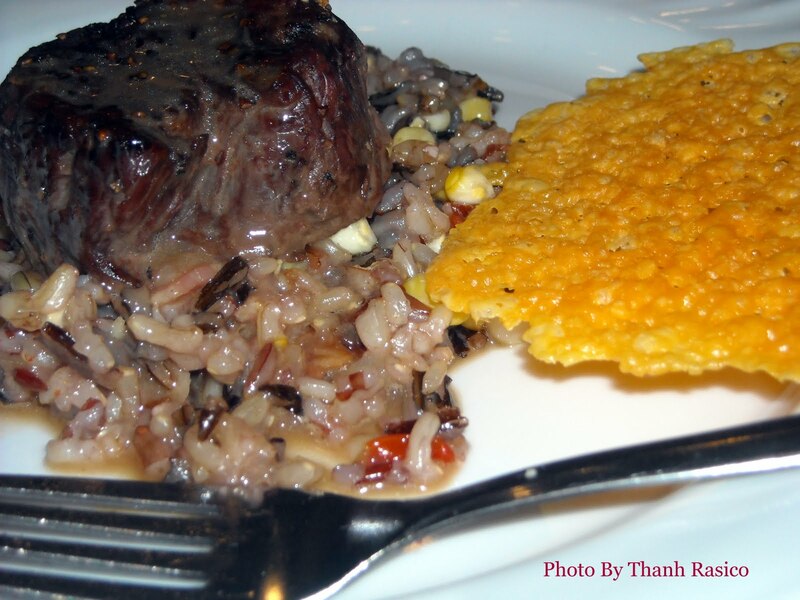 The filet mignon had a cognac beef stock reduction sauce that was so rich...so flavorful...so yummy. 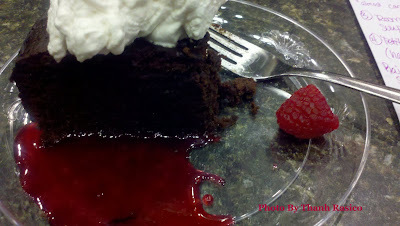 Then, for dessert, we had a flourless chocolate cake with homemade whipped cream and raspberry coulis. I love wonderful Southern hospitality! 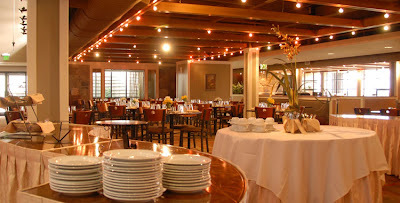 Thank you, Winthrop Rockefeller Institute!